Still in the USA, visiting friends and family and preparing to head back home. NYCC was lots of fun, especially viewing the cosplays and meeting other authors/artists. Meeting everyone at the signing was good, too! 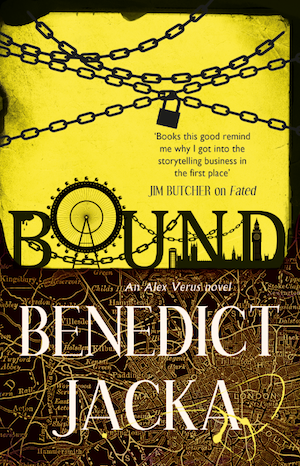 In other news, the copy-edits on Bound are finished and the manuscript’s now pretty much locked in. The UK cover’s also been released, so take a look! Release date is unchanged: the book will be coming out next year, in April 2017. Great to see the cover of Bound snd know when it will be available, it must be great to know it is all but done. Have fun with your Family and friends. Are you planning on coming to any of the Comic Cons in the UK? No plans at the moment – I’m going to be focusing on the next book. Will definitely go to one sooner or later, just not sure when! You definitely should try for Dragon Con in Atlanta, or San Diego Comic Con and get on some of the panels which are then shown on You Tube. Jim Butcher has gotten great exposure when he was just starting out and he continues to appear on these panels. Also gives your fans a chance to say hello! Did you spend any time with Shecky this time around? Missed him this time sadly.